How to add funky drums to horn-driven bands. What do you get when you mess with the bull? You get the horns! 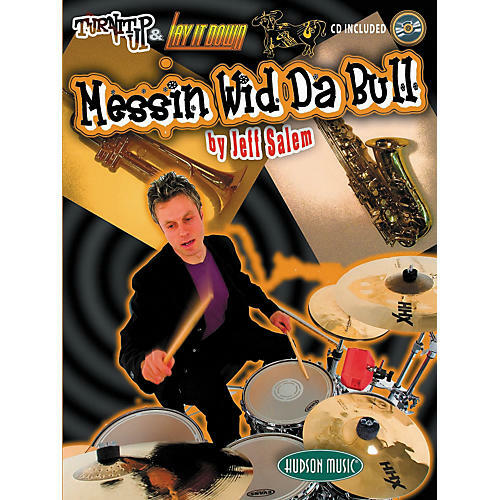 In Messin Wid Da Bull-part of Hudson Music's popular "Turn it Up & Lay It Down" series-drummer Jeff Salem provides an incredibly complete educational look at how to approach grooves, fills, drum part construction, setting up horn figures, and various other musical twists and turns in 13 extremely funky charts in this book. The included CD is the original Messin' Wid Da Bull play-along CD, featuring songs that pay homage to the great horn bands of the '70s, like Tower of Power; Blood, Sweat & Tears; Chicago; Earth, Wind & Fire; Average White Band; and others. The book presents detailed concepts and explanations that will not only get you playing these particular songs in a very funky manner, but will improve your approach to this genre overall. Get on the good foot and order this potent book/CD pronto.